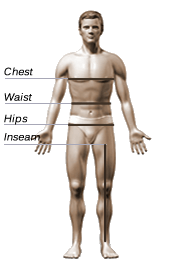 Take a snug measurement around your waist line right above the hip bone. Unzip garment, step into garment and pull up. Zip up to tighten. Built for men, the Zip-n-Trim Boxer Brief disappears under clothing and so do the bulges. This firm control men's brief provides you with a toned mid-section and provides you with the back support you need. A 8-inch power waistband forces down the unwanted bulges in your mid-section, your sparetire and your back. The off to the side zipper design makes for an easy on and off. The boxer is of an ultralight cotton spandex compression fabric that moves with you and keeps you cool and comfortable all day. Excellent for working out or simply for everyday wear. The crotch is of cotton in a pouch design with an convenient fly opening. Truly slims down the spare tire. If you need to lose twenty pounds, and don't have the time to get it off for a special event...it is great!!! This under-garment is ok for what it does; but is certainly no bargain at the price. In my opinion, it should sell for 8 or 10 dollars - MAX!Additionally, the zipper is of poor to medium quality and will surely pull open eventually, rendering the product useless. Imagine all the stress on a tiny zipper try to hold in your entire fat tummy! Physics, my dear. Simply physics. the product ordered was for my brother for back support and to trim his waist for his WWII uniform. it is of excellent quality and he is very satisfied with the product. i would recommend it to anyone. I'm very impressed with the Zip-N-Trim Support Brief Girdle for men w/6 inch Powerband. I hope at some point to purchase the 10 inch powerband version. If the 6 inch version provides back support I can only imagine what the 10 inch version can do. I highly recommend this product for men who are looking for back support and who also want to look trimmer. 6-inch powerband rolls down on me after bending and sitting. The product design is generally good, but I don't think the 6-inch powerband is enough for a tall person. I am 6'2" and it kept riding down on me after normal stooping, sitting or bending. It would probably work fine on a shorter person. I have since tried the 10 inch powerband with better results. The item ran smaller than we thought and once you have tried it on you can't return it. Instead of wearing a brace- the Zip-N-Trim Support Girdle worked great. It gives me the needed support and I really enjoy the comfort and ease it gives. Bought this as a gift for a man friend. He loved ths gift and is using it. I think he is satisfied with how it fits. I use it for when my back is hurting and when I am feeling bloated from my meds. love it. Runs a bit large if you go by the size chart, so if you want a snug fit, it is probably a good idea to go one size down. My husband loves that it smooths out the "love handles"! I wear an underworks Zip-N-Trim 8" girdle all day every day - it really holds me in. It is difficult to put on after a shower butnylon brief solves that. I am not at all self conscious being girdled and in fact would not leave home without one on. I nowhave three - one in black - wear one, one in wash and one in draw. At first girdle is tight, then comfortable and then I forgetI wear one. In fact I do not want to take it off. Wearing a girdle makes my clothes look better and me feel better. I haveno problem and no would ever guess. Fits great and serves its purpose! It fits well, it's sized correctly, it arrived on time and it looks good. It's not as strong as I hoped. It reduces curves but not by as much as you'd expect a girdle to, but it still works very well. If they had opened the crotch a little bit more, it would've been a universal fit for even taller guys, but overall, it was good. I actually bought one size to small. It will eventually fit since my doctor told me to loose some weight. Then it will fit perfectly. My husband needs stomach support to releave back and hip discomfort . This works very well! It doesn't ride up;no continued pulling it back in place. The stays don't seem to be an issue.We have already purchased a size smaller to be used soon after he looses a few more pounds. I do wish that it could be machine washed. these really help get through the day, support without the pain.